“Little Red Riding Hood” by The Brothers Grimm, illustrated by Nancy Wiley. Wiley hand-painted the cast resin dolls she used to illustrate “Little Red Riding Hood.” “Red Riding Hood” is an 11-inch doll with bendable arms and hand-painted costume. “Wolf” is a 13-inch doll with faux fur, bendable arms and head, and hand-painted costume. Both dolls are available in limited editions of 200 priced at $350. But as she pursued an education in illustration (she graduated from the prestigious Rhode Island School of Design), she always saw herself becoming a children’s book illustrator. “I really love fairy tales and children’s literature,” said Wiley, 48. She especially admired the work of illustrators Arthur Rackham and Maurice Sendak. Wiley’s love of illustration isn’t lost on her dolls — in fact, her two most recent projects have seamlessly married her interest in both fairy tales and dollmaking. In 2009 she merged those interests when she created hand-painted, limited-edition dolls based on the characters in Lewis Carroll’s “Alice’s Adventures in Wonderland,” then photographed them to illustrate her own hardcover edition of Carroll’s book. “I just really wanted to try the illustration,” she recalled. “Since I had been doing the dolls for 20 years, I thought I’d combine the two.” Wiley said the 88-page “Alice” book — featuring handmade dolls of Alice, the Mad Hatter, the Queen of Hearts, the Duchess, the Cheshire Cat and the White Rabbit — took about a year to complete (you can watch a video of Wiley creating her book illustrations at www.wonderlandbook.com/illustrations.html and in this issue’s digital edition). “When I photographed my work to serve as illustrations for [the Alice book], I felt I had come full circle,” Wiley said. After her success with that book and doll collection, Wiley’s work took a Grimm turn, as she created dolls and an accompanying book based on the Brothers Grimm tale “Little Red Riding Hood.” “I wanted to do a simpler one for the second story,” she said. Her research began last summer, when she visited the Adirondacks and took pictures of forest scenes — including shots of her 6-year-old daughter, Elizabeth, roaming the woods in a red hooded sweatshirt. “Red Riding Hood” features the heroine as an 11-inch hand-painted cast resin doll. The daunting “Wolf,” with his menacing eyes, is made in the same medium and measures 13 inches. In Wiley’s book, the dolls are photographed against backdrops to set the scenes. “I make the characters first, then I paint a backdrop on canvas. This particular story was supposed to look like a stage play,” Wiley said. Wiley published both children’s books herself, with computer design assistance from Florida doll artist Chris Chomick. 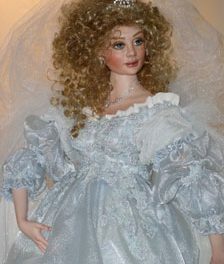 Next up for Wiley, a longtime member of the National Institute of American Doll Artists (NIADA), is her interpretation of Charles Perrault’s tale “Cinderella” — probably for 2013. “I want it to be very over-the-top,” she said, adding that she’s particularly interested in designing a fabulous coach for Cinderella. Down the road, Wiley said, she’d love to do more book-related projects, maybe even an original tale. “I’m not ready yet,” she concluded. See more of Nancy Wiley’s work at www.nancywiley.com. Wiley will also present a solo show at the Strong Museum of Play in Rochester, N.Y., displaying her “Red Riding Hood” book layout as well as the dolls. The show will run from mid-October to January 2013. For more information, visit www.museumofplay.org. PreviousEmpty Nest Syndrome: From the Obamas to the Simpsons, Spice Girls to Star Trek, matryoshkas are madcap! NextCuckoo for Kewpies: The adorable love messengers are turning 100 years old.